Writing a project proposal is a challenging task that requires a certain level of passion, attention to details and effort. A project proposal is an important formal document that needs a favorable response from the sponsors who will receive, review, approve and finance it. Therefore, it is essential that it is done in a complete and comprehensible manner, regardless of the goals or complexity it involves. This is what disheartens many from even attempting to write one. For others, it is a dreadful and joyless task that just has to be accomplished. Given a choice between writing a project proposal and reading a fantasy book or watching a science fiction movie, the winning choice is obvious. Many people grew up with great stories and movies, and some can even remember famous quotes, characters, plots or scenes from them. But what if these same characters and stories can guide people to writing good project proposals? What if these favorite fictional problems and scenarios that people have played, analyzed and solved countless times in their minds can guide them to come up with a project proposal that tackles real-life problems and scenarios? 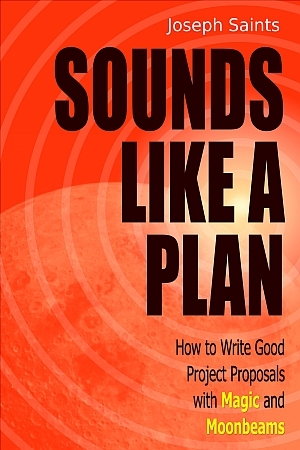 Sounds Like A Plan is a one-of-a-kind how-to manual that helps define what a project proposal is, what parts it should have, and what contents the pages should have by giving explanations and memorable samples of these pages with the help of popular plots and twists. Furthermore, it provides tips in coming up with attractive titles, writing clear sentences, organizing ideas, suggesting backup plans, and budgeting project costs. Writing that next project proposal will be much easier and more exciting. Of course, accomplishing this may sometimes involve the wave of a wand or the firing of lasers at an enemy base.